© 2018 Sloop GD, et al. This is an open-access article distributed under the terms of the Creative Commons Attribution License, which permits unrestricted use, distribution, and reproduction in any medium, provided the original author and source are credited. The authors hypothesize that thrombosis causes both the complications of atherosclerosis as well as the underlying lesion, the atherosclerotic plaque. Atherosclerotic plaques develop from the organization of mural thrombi. In this process, circulating progenitor cells trapped within the thrombus differentiate into myofibroblasts which synthesize collagen, and endothelial cells which form granulation tissue. Eventually, all or most of the thrombus is replaced by collagen. Thus, conditions and drugs which affect thrombosis also affect the development of atherosclerotic plaques, i.e., atherogenesis. 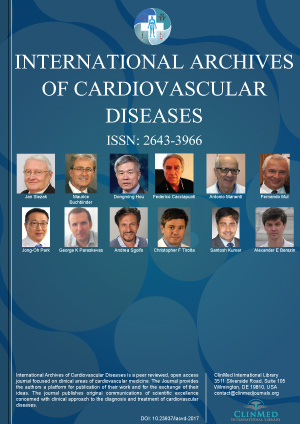 The authors review the process of organization and evidence showing that altered hemodynamics, increased blood viscosity, thrombophilias, coagulopathies, myeloproliferative disorders and drugs which modify the risk of thrombosis also affect atherogenesis. Accelerated atherogenesis is an underappreciated complication of many of these conditions. This paradigm explains how diverse risk factors, many of which have no association with inflammation or dyslipidemia, cause the same lesion. These data have implications for atherothrombosis theory and clinical practice. Gregory D Sloop, MD, Associate Professor of Pathology, Idaho College of Osteopathic Medicine, 105 27th St S, Great Falls, MT 59401, 1401 E. Central Dr., Meridian, Idaho, 83642, USA.